Hungarian rabbi; born at Podola, Comitat Neutra, 1800; died at Erlau 1881. 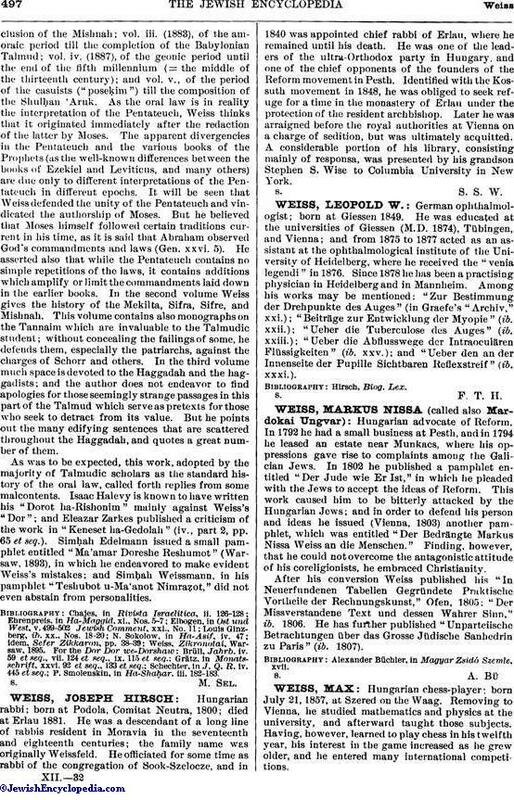 He was a descendant of a long line of rabbis resident in Moravia in the seventeenth and eighteenth centuries; the family name was originally Weissfeld. He officiated for some time as rabbi of the congregation of Sook-Szelocze, and in 1840 was appointed chief rabbi of Erlau, where he remained until his death. He was one of the leaders of the ultra-Orthodox party in Hungary, and one of the chief opponents of the founders of the Reform movement in Pesth. Identified with the Kossuth movement in 1848, he was obliged to seek refuge for a time in the monastery of Erlau under the protection of the resident archbishop. Later he was arraigned before the royal authorities at Vienna on a charge of sedition, but was ultimately acquitted. A considerable portion of his library, consisting mainly of responsa, was presented by his grandson Stephen S. Wise to Columbia University in New York.